Engineer vs. Technician- What’s the difference? Within a number of industries, there are two terms used to describe different types of jobs- engineers and technicians. Within the healthcare industry there are Pharmacy Technicians, Ultrasound Technicians, etc. The cable company will send out Technicians to install your cable boxes, and a Train Engineer will help get you to work on time (some days). Although these two job titles exist across a variety of industries, the descriptions of these positions will vary from industry to industry. Given the large number of technician and engineer positions that exist across the industries, many people use either term to describe a job, thinking that the titles themselves are interchangeable. Even within the IT industry itself, you will find employees, and companies in general, that use either term. But, after 20+ years working in this industry, the team at Network Depot has come up with very distinct boundaries that separate an engineer from a technician, and for us, the two terms are used very deliberately. Let’s start with a technician. A technician is an employee that is assigned a task, and will do that task to the best of their ability. They are committed to solving the problem in front of them, and making sure it is fixed to the satisfaction of the customer. In a sense, the life cycle of a technician is: they learn how to fix a problem, and then when that problem is presented to them by a customer, they follow the procedure they learned in order to fix the issue. And this can be the case for a large number of issues. Technicians are usually very good at what they do. They can identify what an issue is, and they have the knowledge, experience, and training to be able to fix it. In a certain respect, a technician is always in “go” mode. They are interested in solving the problem in front of them and are always looking to help fix customer issues. An engineer has all the same capabilities as a technician. They are trained, experienced, and knowledgeable, and are looking to help fix customer issues to the satisfaction of the client. What differentiates an engineer is that while a technician is always in “go” mode, an engineer will sometimes say “stop”. They have the capacity to take a step back and see more than just the problem in front of them. An engineer will stop to ask questions like “Will installing this new server really be in the best interest of the client, or is there a better way?”, or, “We seem to keep fixing the same problem over and over again, we should stop to figure out why it keeps happening.” An engineer sees the bigger picture, they see not only the problem right now, but the probable condition of a network five, ten, fifteen years down the road, and will provide solutions that not only fix the immediate problems, but will improve the overall health of a network. I don’t think it’s fair to say that one position is actually better than the other. Both roles are important and helpful, it is up to the IT support company to make sure these roles are being utilized in the best possible way for the customer. 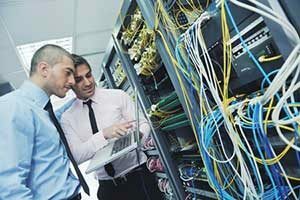 Most IT support companies follow the same infrastructure formula. They have a number of technicians, and only a few engineers. You have experienced this set up I’m sure, every time you call to talk about an IT issue and are put through a “tiered help desk” setup. The first person you talk to will try to fix your issue for a certain amount of time, and then they pass you on to the next level up. And so on, and so on, until you finally reach someone who is able to solve your problem. No doubt, you have gotten extremely frustrated more than once with this. Although we try not to brag on Network Depot too much in this blog, this is one area we want to brag about just a little bit, because our setup is very different than that of a typical IT company. There are two things that make our infrastructure different. One, we don’t have a tiered help desk system. Instead, our dispatcher carefully reviews each ticket, and assigns it right away to the engineer best suited for the task. So, if you are experiencing a really complex, serious issue, you are going to get a high-level engineer working on that problem right away. And if you talk to anyone in our company, you will probably hear them use the phrase “peers not tiers”. It’s a motto we try to live by. Second, we only have one position in our company that has the word “technician”, and that is our bench tech. Everyone else on the service team is reffered to as an “engineer”. And, even the bench tech, who’s primary responsibility is to set up new machines, is constantly training and learning so that they can quickly move up to the level of engineer. Ultimately, we think all the differences between an engineer and a technician can be boiled down to one basic component- Listening. Not just hearing, not just waiting for your turn to talk, but really listening to our customers. The understanding that is gained and the level of service we are able to provide is brought up to a new level by simply listening. So, if we could offer you one piece of advice, it is that when you are talking to an IT company, try asking them what the difference is between a technician and an engineer, and see if you like their answer. How they define these two roles is going to give you a lot of insight into who the company is, how they run, and ultimately, what type of service you can expect from them. What do you think of our definitions of technician and engineer? What are some experiences you’ve had that really showed you the differences?